A CPU cache is a hardware cache used by the central processing unit (CPU) of a computer to reduce the average cost (time or energy) to access data from the main memory. A cache is a smaller, faster memory, closer to a processor core, which stores copies of the data from frequently used main memory locations. Most CPUs have different independent caches, including instruction and data caches, where the data cache is usually organized as a hierarchy of more cache levels (L1, L2, L3, L4, etc.). When trying to read from or write to a location in main memory, the processor checks whether the data from that location is already in the cache. If so, the processor will read from or write to the cache instead of the much slower main memory. Most modern desktop and server CPUs have at least three independent caches: an instruction cache to speed up executable instruction fetch, a data cache to speed up data fetch and store, and a translation lookaside buffer (TLB) used to speed up virtual-to-physical address translation for both executable instructions and data. A single TLB can be provided for access to both instructions and data, or a separate Instruction TLB (ITLB) and data TLB (DTLB) can be provided. The data cache is usually organized as a hierarchy of more cache levels (L1, L2, etc. ; see also multi-level caches below). However, the TLB cache is part of the memory management unit (MMU) and not directly related to the CPU caches. When the processor needs to read or write a location in memory, it first checks for a corresponding entry in the cache. The cache checks for the contents of the requested memory location in any cache lines that might contain that address. If the processor finds that the memory location is in the cache, a cache hit has occurred. However, if the processor does not find the memory location in the cache, a cache miss has occurred. In the case of a cache hit, the processor immediately reads or writes the data in the cache line. For a cache miss, the cache allocates a new entry and copies data from main memory, then the request is fulfilled from the contents of the cache. bits for s cache sets. Cache read misses from an instruction cache generally cause the largest delay, because the processor, or at least the thread of execution, has to wait (stall) until the instruction is fetched from main memory. Cache read misses from a data cache usually cause a smaller delay, because instructions not dependent on the cache read can be issued and continue execution until the data is returned from main memory, and the dependent instructions can resume execution. Cache write misses to a data cache generally cause the shortest delay, because the write can be queued and there are few limitations on the execution of subsequent instructions; the processor can continue until the queue is full. For a detailed introduction to the types of misses, see cache performance measurement and metric. Smart cache is a level 2 or level 3 caching method for multiple execution cores, developed by Intel. Smart Cache shares the actual cache memory between the cores of a multi-core processor. In comparison to a dedicated per-core cache, the overall cache miss rate decreases when not all cores need equal parts of the cache space. Consequently, a single core can use the full level 2 or level 3 cache, if the other cores are inactive. Furthermore, the shared cache makes it faster to share memory among different execution cores. Multi-level caches introduce new design decisions. For instance, in some processors, all data in the L1 cache must also be somewhere in the L2 cache. These caches are called strictly inclusive. Other processors (like the AMD Athlon) have exclusive caches: data is guaranteed to be in at most one of the L1 and L2 caches, never in both. Still other processors (like the Intel Pentium II, III, and 4) do not require that data in the L1 cache also reside in the L2 cache, although it may often do so. There is no universally accepted name for this intermediate policy; two common names are "non-exclusive" and "partially-inclusive". 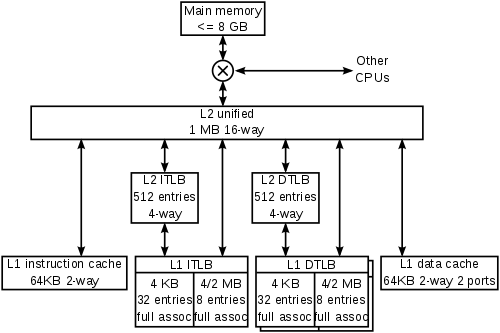 Cache hierarchy of the K8 core in the AMD Athlon 64 CPU. The adjacent diagram is intended to clarify the manner in which the various fields of the address are used. Address bit 31 is most significant, bit 0 is least significant. 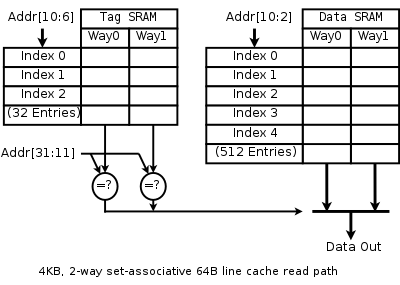 The diagram shows the SRAMs, indexing, and multiplexing for a 4 KB, 2-way set-associative, virtually indexed and virtually tagged cache with 64 byte (B) lines, a 32-bit read width and 32-bit virtual address. ^ The very first paging machine, the Ferranti Atlas had no page tables in main memory; there was an associative memory with one entry for every 512 word page frame of core. ^ Gabriel Torres (September 12, 2007). "How The Cache Memory Works". ^ A few specialized CPUs, accelerators or microcontrollers do not have a cache. To be fast, if needed/wanted, they still have an on-chip scratchpad memory that has a similar function, while software managed. In e.g. microcontrollers it can be better for hard real-time use, to have that or at least no cache, as with one level of memory latencies of loads are predictable. ^ "IBM z13 and IBM z13s Technical Introduction" (PDF). IBM. March 2016. p. 20. ^ "A Survey of Techniques for Architecting TLBs", Concurrency and Computation, 2016. ^ "Cache design" (PDF). ucsd.edu. 2010-12-02. p. 10–15. Retrieved 2014-02-24. ^ IEEE Xplore - Phased set associative cache design for reduced power consumption. Ieeexplore.ieee.org (2009-08-11). Retrieved on 2013-07-30. ^ Sanjeev Jahagirdar; Varghese George; Inder Sodhi; Ryan Wells (2012). "Power Management of the Third Generation Intel Core Micro Architecture formerly codenamed Ivy Bridge" (PDF). hotchips.org. p. 18. Retrieved 2015-12-16. ^ a b André Seznec (1993). "A Case for Two-Way Skewed-Associative Caches". ACM Sigarch Computer Architecture News. 21 (2): 169–178. doi:10.1145/173682.165152. Retrieved 2007-12-13. ^ a b C. Kozyrakis. "Lecture 3: Advanced Caching Techniques" (PDF). Archived from the original (PDF) on September 7, 2012. ^ Micro-Architecture "Skewed-associative caches have ... major advantages over conventional set-associative caches." ^ Nathan N. Sadler; Daniel J. Sorin (2006). "Choosing an Error Protection Scheme for a Microprocessor's L1 Data Cache"" (PDF). p. 4. ^ John L. Hennessy; David A. Patterson (2011). Computer Architecture: A Quantitative Approach. p. B-9. ISBN 978-0-12-383872-8. ^ David A. Patterson; John L. Hennessy (2009). Computer Organization and Design: The Hardware/Software Interface. p. 484. ISBN 978-0-12-374493-7. ^ a b c Gene Cooperman (2003). "Cache Basics". ^ Ben Dugan (2002). "Concerning Cache". ^ Sumner, F. H.; Haley, G.; Chenh, E. C. Y. (1962). "The Central Control Unit of the 'Atlas' Computer". Information Processing 1962. IFIP Congress Proceedings. Proceedings of IFIP Congress 62. Spartan. ^ a b Kilburn, T.; Payne, R. B.; Howarth, D. J. (December 1961). "The Atlas Supervisor". Computers - Key to Total Systems Control. Conferences Proceedings. 20 Proceedings of the Eastern Joint Computer Conference Washington, D.C. Macmillan. pp. 279–294. ^ Kaxiras, Stefanos; Ros, Alberto (2013). A New Perspective for Efficient Virtual-Cache Coherence. 40th International Symposium on Computer Architecture (ISCA). pp. 535–547. CiteSeerX 10.1.1.307.9125. doi:10.1145/2485922.2485968. ISBN 9781450320795. ^ "Understanding Caching". Linux Journal. Retrieved 2010-05-02. ^ Taylor, George; Davies, Peter; Farmwald, Michael (1990). "The TLB Slice - A Low-Cost High-Speed Address Translation Mechanism". CH2887-8/90/0000/0355$01.OO. ^ Timothy Roscoe; Andrew Baumann (2009-03-03). "Advanced Operating Systems Caches and TLBs (263-3800-00L)" (PDF). systems.ethz.ch. Archived from the original (PDF) on 2011-10-07. Retrieved 2016-02-14. ^ a b "Products (Formerly Crystal Well)". Intel. Retrieved 2013-09-15. ^ a b "Intel Iris Pro 5200 Graphics Review: Core i7-4950HQ Tested". AnandTech. Retrieved 2013-09-16. ^ Ian Cutress (September 2, 2015). "The Intel Skylake Mobile and Desktop Launch, with Architecture Analysis". AnandTech. ^ Anand Lal Shimpi (2000-11-20). "The Pentium 4's Cache – Intel Pentium 4 1.4 GHz & 1.5 GHz". AnandTech. Retrieved 2015-11-30. ^ a b Agner Fog (2014-02-19). "The microarchitecture of Intel, AMD and VIA CPUs: An optimization guide for assembly programmers and compiler makers" (PDF). agner.org. Retrieved 2014-03-21. ^ David Kanter (August 26, 2010). "AMD's Bulldozer Microarchitecture - Memory Subsystem Continued". Real World Technologies. ^ David Kanter (September 25, 2010). "Intel's Sandy Bridge Microarchitecture - Instruction Decode and uop Cache". Real World Technologies. ^ a b Baruch Solomon; Avi Mendelson; Doron Orenstein; Yoav Almog; Ronny Ronen (August 2001). "Micro-Operation Cache: A Power Aware Frontend for Variable Instruction Length ISA" (PDF). ISLPED'01: Proceedings of the 2001 International Symposium on Low Power Electronics and Design (IEEE Cat. No.01TH8581). Intel. pp. 4–9. doi:10.1109/LPE.2001.945363. ISBN 978-1-58113-371-4. Retrieved 2013-10-06. ^ a b Anand Lal Shimpi (2012-10-05). "Intel's Haswell Architecture Analyzed". AnandTech. Retrieved 2013-10-20. ^ Ian Cutress (2016-08-18). "AMD Zen Microarchitecture: Dual Schedulers, Micro-Op Cache and Memory Hierarchy Revealed". AnandTech. Retrieved 2017-04-03. ^ Leon Gu; Dipti Motiani (October 2003). "Trace Cache" (PDF). Retrieved 2013-10-06. ^ Kun Niu (28 May 2015). "How does the BTIC (branch target instruction cache) work?". Retrieved 7 April 2018. ^ "Intel Smart Cache: Demo". Intel. Retrieved 2012-01-26. ^ "Inside Intel Core Microarchitecture and Smart Memory Access". Intel. 2006. p. 5. Archived from the original (PDF) on 2011-12-29. Retrieved 2012-01-26. ^ "Intel Iris Pro 5200 Graphics Review: Core i7-4950HQ Tested". AnandTech. Retrieved 2014-02-25. ^ Tian Tian; Chiu-Pi Shih (2012-03-08). "Software Techniques for Shared-Cache Multi-Core Systems". Intel. Retrieved 2015-11-24. ^ Oded Lempel (2013-07-28). "2nd Generation Intel Core Processor Family: Intel Core i7, i5 and i3" (PDF). hotchips.org. p. 7–10,31–45. Retrieved 2014-01-21. ^ Chen, J. Bradley; Borg, Anita; Jouppi, Norman P. (1992). "A Simulation Based Study of TLB Performance". SIGARCH Computer Architecture News. 20 (20): 114–123. doi:10.1145/146628.139708. ^ "Explanation of the L1 and L2 Cache". amecomputers.com. Retrieved 2014-06-09. ^ a b c Ying Zheng; Brian T. Davis; Matthew Jordan (2004-06-25). "Performance Evaluation of Exclusive Cache Hierarchies" (PDF). Michigan Technological University. Retrieved 2014-06-09. ^ Aamer Jaleel; Eric Borch; Malini Bhandaru; Simon C. Steely Jr.; Joel Emer (2010-09-27). "Achieving Non-Inclusive Cache Performance with Inclusive Caches" (PDF). jaleels.org. Retrieved 2014-06-09. ^ "AMD K8". Sandpile.org. Archived from the original on 2007-05-15. Retrieved 2007-06-02. ^ "Cortex-R4 and Cortex-R4F Technical Reference Manual". arm.com. Retrieved 2013-09-28. ^ "L210 Cache Controller Technical Reference Manual". arm.com. Retrieved 2013-09-28. ^ Mahapatra, Nihar R.; Venkatrao, Balakrishna (1999). "The processor-memory bottleneck: problems and solutions" (PDF). Crossroads. 5 (3es): 2–es. doi:10.1145/357783.331677. Retrieved 2013-03-05. ^ GE (January 1968). GE-645 System Manual (PDF). ^ IBM (February 1972). IBM System/360 Model 67 Functional Characteristics (PDF). Third Edition. GA27-2719-2. ^ IBM (June 1968). IBM System/360 Model 85 Functional Characteristics (PDF). SECOND EDITION. A22-6916-1. ^ "Intel® Xeon® Processor E7 Family". Intel. Retrieved 2013-10-10. ^ "Chip Design Thwarts Sneak Attack on Data" by Sally Adee 2009 discusses "A novel cache architecture with enhanced performance and security"   by Zhenghong Wang and Ruby B. Lee: (abstract) "Caches ideally should have low miss rates and short access times, and should be power efficient at the same time. Such design goals are often contradictory in practice." ^ "A Survey Of Architectural Approaches for Managing Embedded DRAM and Non-volatile On-chip Caches", Mittal et al., IEEE TPDS, 2014. ^ "CACTI". Hpl.hp.com. Retrieved 2010-05-02. ^ 3d_cache_modeling_tool / destiny, code.ornl.gov, Retrieved 2015-02-26.